The complete wireless audio and control solution for your home. TuneLink Home protects the fidelity of your music. Replace every remote in your house and turn your entertainment system into a wireless music system! The TuneLink™ wireless audio interface for home audio is the first complete solution that provides a wireless audio link AND a media remote control interface between your iPhone, iPad, iPad Mini, iPod touch mobile devices and your home entertainment or sound system. TuneLink Home includes a state-of-the-art advanced wireless processor to deliver crystal clear audio received over the air from your mobile device to your home entertainment system. Connecting to your audio system over Digital Optical TOSLINK or analog line-level output, TuneLink Home protects the fidelity of your music. Powered by any USB power source or the included adapter guarantees a simple setup. The TuneLink Home includes a powerful universal Infrared remote system. Equipped with an Omni directional IR LED emitter array and an external IR emitter port, TuneLink Home turns your iPhone, iPad, and iPod touch mobile devices into a powerful remote control. Like our fully featured FLPR™ Universal Remote Control, a comprehensive and growing database of over 78,000 remote control codes and the ability to learn custom codes and create macros makes TuneLink Home a powerful addition to your hi-tech lifestyle. TThe FREE TuneLink app downloaded from the App Store allows you to setup and control the TuneLink unit including sophisticated features such as auto-reconnect, auto-play, media-setup on reconnect and our exclusive TuneLink Share modes. TuneLink Share allows for multiple devices to share the audio interface to the sound system in an innovative and social way. Keep your party involved by letting everyone help set the mood for the evening! Complete Control: A comprehensive universal remote control solution that simplifies your life and retires all of your existing remotes into the storage bin. Customize Your Remotes: Select different skins and templates for your remotes or reprogram selected keys with special functions. Create Custom Activities: Create special sequences of IR commands that can be executed with a single tap. IR Code Database Updates: Frequent updates to our remote control code database means new devices are supported.Advanced IR Learning: Your device not in our database? Not a problem as TuneLink Home can learn new codes from existing remote controls. Software Updates: Your TuneLink Home unit is software upgradeable through the app ensuring you will always have access to the latest features and optimum performance. Name Your TuneLink: Create a custom name for your TuneLink device so your friends can find it easily when pairing. Automatic Reconnect: Setup TuneLink Home to find your device and reconnect when you return home. HI-FI Stereo Wireless link: Best-of-Class wireless technology keeps the music playing, without any physical connection to your device. ANALOG Connection: Connect TuneLink Home directly to your home entertainment of sound system via the 3.5 mm stereo line out using the included audio cable. DIGITAL Connection: TuneLink Home includes a State-of-the-Art TOSLINK digital fiber-optic audio port that provides the ultimate high in fidelity connection to your sound system. Powerfull IR BLASTER: Omni-directional IR LED emitter array and an external IR emitter port that is compatible with most IR extenders or wired infrared control ports. Advanced IR Learning Receiver: TuneLink Home includes a broadband IR sensor enabling your to teach TuneLink Home new commands from across the room. PLUG IT: Connect your TuneLink Home to your entertainment system over the Digital Optical TOSLINK or analog line-level output. PLAY IT: TuneLink Home will play audio from ANY app on your device to your audio system up to 100 feet away. CONTROL IT: With 80,000 IR pre-programmed remote codes, setting up and controlling your home devices is a few taps. SHARE IT: Set the share mode you want active through the TuneLink Home application. Is TuneLink Home compatible with iOS? Yes. TuneLink Home is compatible with iPhone, iPad, iPod touch. TuneLink Home detects when it is connected to an iOS device. TuneLink Home glows blue when connected to an iOS device. How do I set up TuneLink Home? Simply attach the USB cable to the supplied power adapter or any spare USB port, and then attach the audio cable between TuneLink Home and your stereo. Once powered up, TuneLink Home will glow blue and is ready to pair to your device. Once you pair your device, TuneLink Home is ready for streaming audio from any app. To use TuneLink Home as a universal remote control, download the app from the Apple iTunes store. From within the app, setting up remotes to replace your existing remotes takes just a few moments. What kind of range can I expect between my mobile device and TuneLink Home? TuneLink Home's range averages well over 100 feet in just about any scenario. This may vary depending many factors including how many walls are between your mobile device and TuneLink Home, what device you have paired to TuneLink Home, and where your TuneLink Home is positioned. How can I update the firmware in my TuneLink Home? TuneLink Home can be updated with the latest firmware over the Bluetooth® link using the TuneLink Home app. Simply navigate to the settings page of the app to see if a firmware update is available, then follow a few simple steps to complete the update. TuneLink Home's firmware update capability ensures that TuneLink Home will always be up to date with the latest features. TuneLink Home's "Auto-connect" feature creates a wireless Bluetooth® connection that behaves very similar to a typical Wi-Fi network. If your device is in range with Bluetooth® enabled and you have previously paired your device with TuneLink Home, then TuneLink Home will automatically connect to your device. This is much more convenient than other devices which require you to pair your device each time you want to use it. As long as you leave Bluetooth® enabled, then TuneLink Home "just works". If you prefer to use TuneLink Home without the auto-connect feature, simply navigate to the settings page of the app and set Auto-Connect to OFF. In this mode, you must pair your device to TuneLink Home each time you wish to use it or go outside the range of TuneLink Home. Do I need anything else like a Wi-Fi router to use TuneLink Home? No. TuneLink Home connects directly to the built-in Bluetooth® transceiver in your device and does not require purchasing any additional hardware. Can I use TuneLink Home to listen to apps like Spotify and Pandora? Does TuneLink Home affect the way I make phone calls? I've heard that Bluetooth® Audio quality may not sound as good as a direct wire. What does TuneLink Home do differently from other products that makes it sound so good? To start, not all Bluetooth® audio devices are created equal. There are numerous codecs (encoding and decoding algorithms) that may be used for sending audio over the Bluetooth® wireless link. Not only does TuneLink Home use the highest quality codecs available, we have also included an audiophile quality DAC in order to ensure the fidelity of your music. If your stereo has an optical input, TuneLink Home goes one step further and provides true digital-to-digital delivery of your audio through the TOSLINK jack. In a blind test, even the most discerning listeners will have trouble discerning TuneLink Home from a wire. How does TuneLink Home work as a universal remote control? TuneLink Home connects with your mobile device using a long-rang Bluetooth® connection. Using the TuneLink Home app, virtual remote controls are then downloaded and saved in the app. When buttons are pressed on the virtual remote control, the remote code is sent over the Bluetooth® link then converted to an IR signal inside TuneLink Home. TuneLink Home houses a powerful array of IR emitters that flood the room with invisible IR light to take control of all your devices. What is the range of TuneLink Home's IR emitters? On average, TuneLink Home can control IR devices up to 45 feet away. This figure may be shorter or longer depending on several factors, including the remote control protocol being used. Some examples of situations in which the range might be shorter include a blocked or altered IR receiver, bright sunlight or certain types of fluorescent lighting, or incomplete custom device training (command key learning). TuneLink Home's wireless connection means that it may be set up in wherever is most convenient. Typically, TuneLink Home works best when set up near your entertainment center and facing out into the room. I can't find my device in the remote control database. Can I still use TuneLink Home to control my device? Yes! TuneLink Home is also a learning remote control. This method requires you to still have the original remote control that works with your device, but is the quickest way to get TuneLink Home to control any device. To get started, choose "Custom" instead of the device type and follow the wizard. My satellite/cable box does not seem to respond to TuneLink Home's remote control. Why? Your satellite receiver (i.e. DirecTV, Time Warner, Scientific Atlantic, etc…) is likely set to receive signals in RF mode, and if it's set to RF, it ignores the IR input. In your settings, you can set you receiver to receive IR signals. If an address setting is required by your set-top box, set it to remote address 1. What is the "iR Out" jack for on the back of TuneLink Home? This jack may be used to connect any standard IR repeater cable to TuneLink Home. In many entertainment systems, it is common to have a receiver or satellite box hidden inside a cabinet. IR requires "line-of-sight" in order to function, so the cabinet may interfere with TuneLink Home's ability to control items that are hidden from it. Use the iR Out jack to eliminate this issue.. I want to create a series of button commands that will execute when I press one button. Can TuneLink Home do that? Yes. This can be done by setting up an "Activity". Each activity stores a sequence of keys that can come from any virtual remote control you have set up in the app. To create a new activity, navigate to the "My Remotes" page and tap "Add". Select "Activity", then begin pressing the buttons you wish to record. The red bar at the bottom allows you to insert delays using the clock icon and save the activity using the check icon. Do I have to use the FREE app to play my music (ie. Pandora)? You will need the TuneLink home app to setup any universal remote control features and control any sharing modes within TuneLink Home. The TuneLink Home app offers convenient music controls, but once TuneLink is plugged in and paired with a device, users have the flexibility to play their music from within the TuneLink app or from the iPhone, iPod touch, iPad native music player. You can also listen to Internet radio stations such as Pandora, Spotify, We7, Slacker, Youtube, Accuradio, Iheart, Grooveshark, Shoutcast, Radiorage. 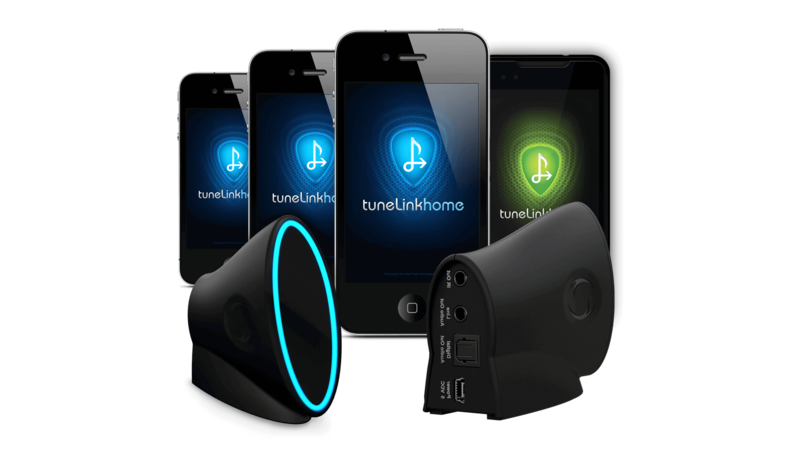 TuneLink Home will pair with any device that supports the A2DP Bluetooth® stereo audio standard including Blackberry, Android, or other capable mobile devices. Some product features require the application for complete function, but we have found that Android will play through TuneLink and charge from Tunelink without problems.